These pumpkin bowls make beautiful serving dishes for any autumn event. 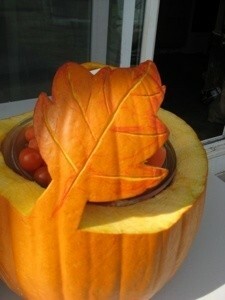 Look for a picture of a pumpkin leaf and use that for inspiration for the leaf you will cut out of your pumpkin. Cut around the stem to make a hole big enough to clean it out. Lightly draw the outer edge of the leaf you will cut out towards the top of the pumpkin. Cut around the lines, then cut around the pumpkin. You will want a hole big enough to fit a bowl inside it. I used a clear glass bowl so it would blend in. With a small knife carve shallow lines for the veins of the leaf. Cut diagonally into the skin of the pumpkin, cut a line down the center of the leaf about 1/16 of an inch deep. Then cut diagonally the other direction parallel to the previous line, this will make a "v" cut. Then pull out the strip of skin. Add more veins shooting off from the center vein. If you still see the orange marker lines around the leaf add more color around the edges and near the vein lines. 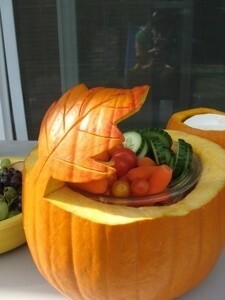 Place the bowl inside and fill with vegetables or any other snack you would like. With the smaller pumpkin you can cut the edge any way you would like as long as you still can use it. You can put your favorite vegetable dip nested inside, or you could use it to serve something else. 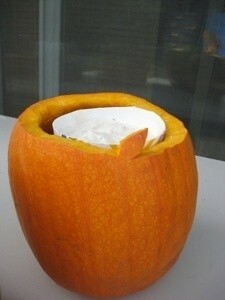 Tip: If you use sour cream or yogurt in your dip, save the container and cut it down to fit inside the pumpkin.